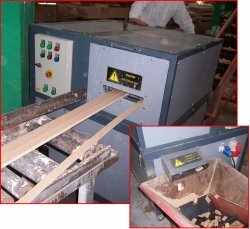 In this application, we undertook to design a machine to process saw off-cut of several meters into a format that could be handled more efficiently and would be suitable as gasification fuel. The machine shown is a fully self-contained system that processed more than 1 Tonne of material/hour. In a control application of this scale, the PLC's baby brother, the Smart Relay was used. This was programmed to monitor analogues such as hydraulic oil temperature and pressure and digitals Such as start and stop buttons. The Smart relay even logs the run time and material jams for maintenance purposes. 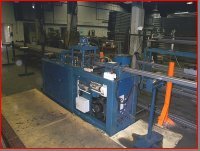 A new punching machine was designed and built for Sperrin Metal Products Ltd, including a PLC control system. The operation of the old machine had been controlled by hydraulic pressure switches - a slow and maintenance-hungry system. Once installed, the new PLC controlled machine improved the throughput by up to 60%. A PLC control system equipped with an touch screen (HMI) offers a very effective interface between operator and machine, allowing operational adjustments and monitoring the system during use. 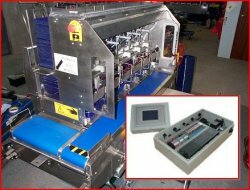 An example of where this system has successfully been used is in the control of a locally designed Mushroom Grading machine. 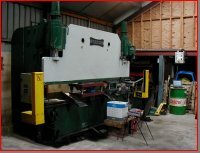 The machine is now being used by some of the UK's biggest growers and is a unique solution to making growing houses more efficient in a very competitive business. ITI use the following PLC manufacturers regularly, though alternatives can be considered as required by project or client.